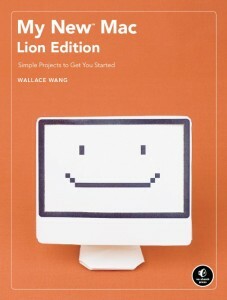 A bit over three years ago I compared two Macintosh books for beginners, David Pogue’s Mac OS X Leopard Edition: The Missing Manual and Wallace Wang’s My New Mac. To cut a long story short, they’re both good books, but aimed at somewhat different audiences. The Missing Manual covers just about every aspect of the Mac operating system, giving power users the information they need to do all sorts of different things. But it doesn’t actually tell a new Mac user what they can do with their computer. To get the most from The Missing Manual, you need to have a fair idea of what you want to do first. My New Mac is different. It uses an unusual task-centred approach that shows the reader how to use their Macintosh to do a variety of different home, work and leisure tasks. That way, the operating system is learnt almost by osmosis. It’s a kinaesthetic approach of the sort popular with schoolteachers who want to avoid dumping a whole heap of theory in front of their students. Done properly, this approach can be extremely effective, and thankfully Wang delivers a balanced programme of more than fifty chapters, each of which given over to a particular activity. There are 56 chapters in total, arranged into seven sections, with the first chapter focusing on basic skills like the use of menu bar items and Dock customisation. File and folder navigation is covered in the second section, and the third section finishes off the Wang’s look at the fundamentals with ten chapters on operating system features like the Mac App Store, Dashboard and iCal. The remaining four sections comprise chapters on doing particular things with your Mac, starting with playing music and movies, then managing digital photos, using the internet, and finally Macintosh security and maintenance. Within these broad sectional headings are chapters focused on clearly-defined tasks of the sorts beginners will be wrestling with: installing software, setting up e-mail accounts, configuring parental controls, editing photos, and so on. It’s telling that the book lists its contents in two ways, first with a succinct list of chapter headings within each section, and then in a more in-depth way, with chapter content teased out into what’s being used, how it works, what it does, and how it can be adjusted or expanded to better suit the needs of the user. As described above, My New Mac has a lot in common with the previous edition, but what has changed here is the OS X Lion focus. New features like document versions, trackpad gestures and the application Launchpad are covered in depth. Although Wang’s approach mightn’t suit those looking for a feature-by-feature review of the Mac OS, where this book really scores is in having a logical series of task-based chapters that puts practical skills ahead of theory. Bottom line, in its new version My New Mac remains one of the best books for absolute beginners wanting to get their new Mac earning its keep as quickly and painlessly as possible. Recommended; MyMac rating: 10/10.